Monetary and fiscal policy is usually the realm of Central bankers. The Reserve Bank of India (“RBI”) makes decisions and communicates them to Banks, followed by an appropriate Press Release. But the NDA government has proven itself exceptionally innovative and media-savvy, and thus, on November 8, we saw the perhaps unprecedented spectacle of an Indian Prime Minister making a currency-policy announcement. Ordinary people do not have a lot of cash lying around, whether in high-denomination notes or otherwise. Indeed, the provision for changing your currency notes in Banks and post offices is very generous, and for the ordinary honest citizen with maybe Rs. 10-15,000/- lying at home, it’s the slight inconvenience of making a couple of visits to the Bank. As I have mentioned earlier, unlike earlier instances, these changes have not been implemented with consultation from Banks and the Reserve Bank. As a result, there is likely to be a period of confusion while Banks try to figure this out. So not just exchange of cash, but even normal banking operations could be affected, slowing down your payments and so on. It is obvious that the push is towards moving towards electronic payments. This means those of us with unused Debit and credit cards will have to learn to start using them. And if you don’t have either of these, start preparing your KYC documents, because you will need one soon. For those who run shops that do not accept cards – which is a lot of groceries, restaurants and so on – it might be time to start looking for card-readers. The fact is that with inflation being what it is, running up a bill of more than Rs 500 – 1,000/- is very easy even at an ordinary grocery. It might be time for the smaller shops to consider acquiring card-reader machines. The definition of ‘poor’ has changed considerably over the past few decades, and it is not unusual for a person who would be considered ‘very poor’, like domestic help and so on, to be drawing a salary in the thousands. These people will need to open bank accounts – or start using the ones they have – and make themselves familiar with using them. Black money has been the scourge of the real estate sector since time immemorial. With the removal of high-denomination notes and restrictions on withdrawal, it will now become much more difficult to carry out such transactions. If everything goes as the Government has planned it, it should lead to a cleaning up of the market and closer alignment with real value. The final implications will take, as mentioned at the beginning, some time to become clear. While we wait for the RBI to show us the shape of things to come, it is well to sit back and relax for a while, and remember that this move is targeted at wrongdoers with black money. For the ordinary Indian, its just a small inconvenience that can easily be overcome. "People often ask me why my style is so simple. It is, in fact, deceptively simple, for no two sentences are alike. It is clarity that I am striving to attain, not simplicity. Of course, some people want literature to be difficult and there are writers who like to make their readers toil and sweat. They hope to be taken more seriously that way. I have always tried to achieve a prose that is easy and conversational. And those who think this is simple should try it for themselves." 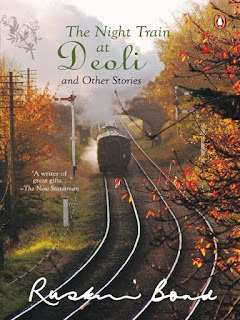 Ruskin Bond's 'The Night Train at Deoli and Other Stories' takes you to a time long ago, a world away from now, tinged with nostalgia and that hint of melancholy that you feel on a winters night when the cold seeps into your bones and you face lost dreams and innocent hopes of childhood through the words written on the page. For those willing to take a stroll through a bygone era, lost in the mire of urbanism and capitalism, the works of Ruskin Bond are a joy, taking you through the beautiful hills and meadows of India, delighting you with stories of love, loneliness, fondness, all with a hint of melancholic nostalgia, as you go through a time you have just missed by being born just a generation too late. The Night Train of Deoli & Other Stories is one such book, full of rustic beauty and a certain theme of longing running through them, as you dream of the hills, of the incessant call from atop those misty mountains, with their cold air freezing you, and through his words, you are transported to the hearth-fire in a ramshackle hut, feeling as if you are listening to grandpa’s stories while you sip a cup of hot coffee made by grandma, watching the mists and winds roll along the highlands, painting the world in tones of wispy green and vibrant blue. As the author himself mentions in the preface of the book, his stories are not about espionage, mystery, suspense or murder. Instead, these are simple stories of simple folk, living in the pure and unspoilt lands of the hills, forests, with their bazaars, all cradled in nature’s lap. The stories are not only beautifully crafted, they are also poignantly done, and within the span of a couple of pages (the stories rarely run longer than 3-4 pages), Mr. Ruskin Bond is able to take your hand and bring you with him into his world, into the majestic foothills of the Himalayas, where he spent the majority of his childhood and teenage years, where he first forayed into the world of stories, with the mountain divulging their secrets to him and the winds whispering many-a-tales into his ears. These are tales of a world unsullied, of an era which spoke not of murder and war and thrills, but of quietude, melancholy, wonder, longing, loneliness, and an unknown yearning from the depths of the heart. The highest praise I can give this book is that it feels like one of the legendary Enid Blyton’s books, but instead of the United Kingdom, it is one set in the beautiful mountains of India. If you are a first time reader, new to the art of reading, pick up this book, I assure you that you won’t be disappointed. And if you are an experienced reader who has yet to read one of Mr. Ruskin Bond’s delightful books, pick this one up, even connoisseurs yearn can do with the magic of his books.